Experience luxurious, modern accommodations at Renaissance Orlando Airport Hotel, boasting first-class guest rooms with all the deluxe amenities you desire. Conveniently located minutes from Orlando International Airport and Lake Nona Medical City, our full-service hotel's features include 24hr complimentary airport transportation and easy access to all of Orlandos major expressways. Discover your runway haven by our large outdoor pool with extra-large cabanas and a spacious whirlpool. The delicious cuisine at our vibrant on-site restaurant, Fresco, distinguishes us from other hotels near Orlando International Airport. 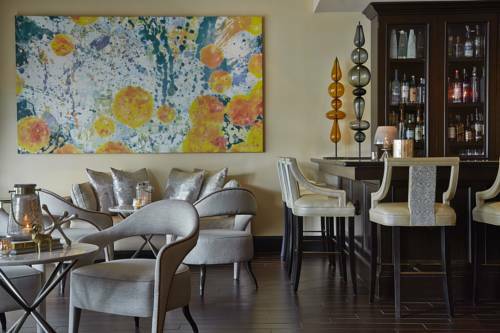 Unwind with cocktails in the sophisticated ambiance of Malabar, the perfect place to socialize. Our amenities also include close proximity to premier attractions, complimentary Wi-Fi access in the lobby, an extensive fitness center, an on-site Navigator and Concierge service. Discover the benefits of staying at the unforgettable Renaissance Orlando Airport Hotel. Fresco Moderne Brasserie: Eclectic cuisine - One of the most welcoming restaurants near Orlando airport, enjoy a wide-range of offerings any time of day including a spectacular breakfast buffet. Malabar: Premier among Orlando airport restaurants, Malabar is the ideal location to meet up with friends for a relaxing evening. Unwind with a specialty drink, beer or glass of wine and savory entrees sure to please any palate. Caffe Siena: A grab-n-go eatery featuring light fare & specialty coffees.